The office will be open Fridays, July 7, July 21, July 28, August 4, August 11, and August 25! We will be open Mondays, July 10 and August 14! 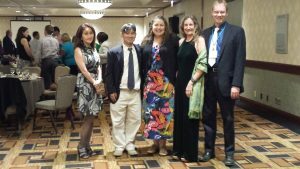 Dr. Maria Coffman and Dr. David Spencer attended the OCA Annual Conference in Minneapolis, Minnesota in June. Dr. Coffman completed her cranial proficiency certificate. She was also appointed co-chair of the International Committee with Eric Hupet, D.O. of Belgium. Congratulations to Dr. David Spencer! He has completed specialized training in Internal Medicine, Neuromusculoskeletal Medicine, and Osteopathic Manipulative Medicine. Look for him in the office during July and August! Congratulations to Mikayla Knaebel! Mikayla will be attending the newest of osteopathic medical colleges in Joplin, MO, beginning in July! We are working on finishing up our research project with ATSU, so ask us if you qualify! Pictured below (right to left): Dr. David Spencer, Dr. Maria Coffman, Kathryn Tupper, D.O. of Australia, Itsuji, D.O. and his translator from Japan.